Discussion in 'General Discussion archive 2017 (read-only)' started by Famous when dead, Sep 4, 2017. Good version, but what the hell is that second voice when he sings Bigmouth?? Think it's a pitch-shifter. Or maybe a harmonizer. They seem to have used it for a few gigs before deciding it was a bad idea. Even on the album version I always thought it sounded strange. As if choir vocals behind the leading voice were doubled and recorded at higher speed. I thought it sounded like The Muppets. 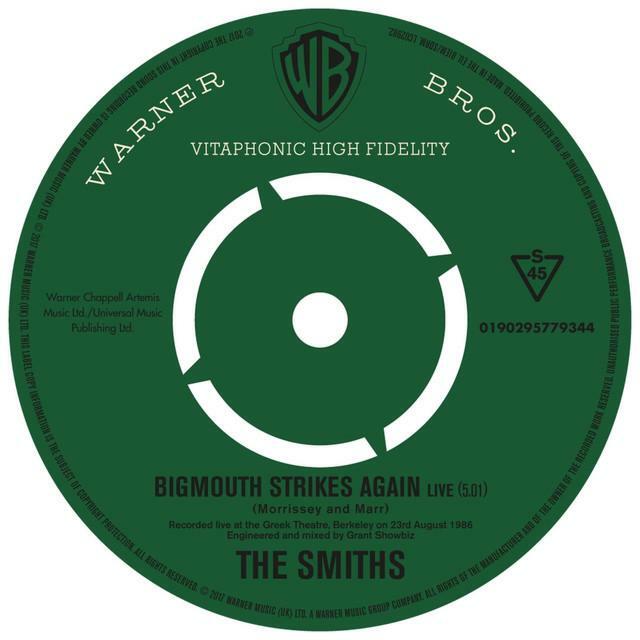 But don't get me wrong, Bigmouth is a hell of a song as Brian Eno said and a great single! "Meanwhile, take a look at the album credits and you'll see that the slightly weird-sounding, high-pitched backing vocals on 'The Queen Is Dead' and several other tracks were performed by one Ann Coates. Ever wonder what happened to her? If so, you'll be hard pressed to find out. Ms. Coates, you see, was otherwise known as Morrissey with a pitch-shifter. Oh, thanks for that too FWD! Still can't say I really like what it sounds like but at the same time it gave the song a strange, surreal feeling. The QOBUZ .wma & .wav files of Bigmouth live are just being uploaded to the downloads section of the forum. It's great they post these live versions in Spotify. It's a great way of waiting for the new songs, too. Moz does a mighty fine Turkey Holler at 0:30.
sounds good.once theyr all finished someone will bung them onto a file and there you go a live album. Bigmouth is brilliant, but I find this version way too distracting ... much more so than the TQID version. As heretical as it may sound, I think I prefer the Live At Earls Court version. I wait for you every day and night of my life so I know what waiting is. Anything that helps promote is good in my book. I don't disagree with the sentiment, but given its recent use by The Smiths and possibly Moz, perhaps he should be a bit more guarded. I think most 'end users' are very happy music will be available via Spotify. 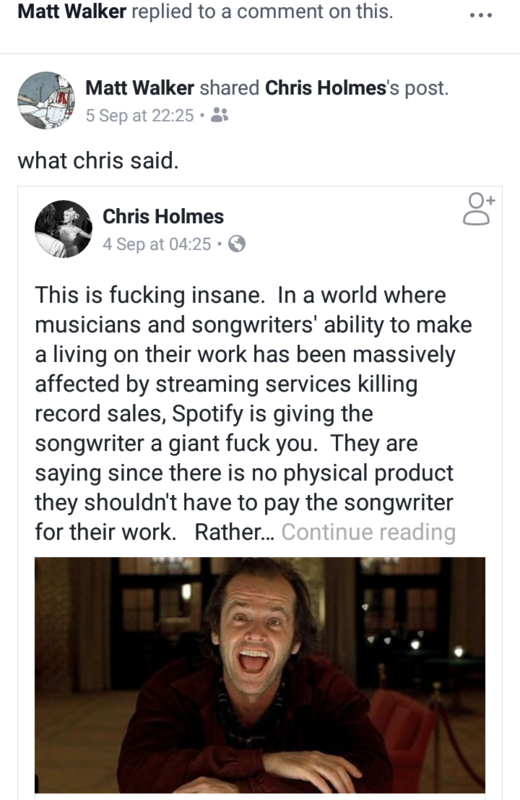 Of course Spotify should pay songwriters! Of course big companies say they don't have to when they have to pay money! It's a classic and that's the same answer given by any thief who steal your assets in any circumstance. Spotify is based in Sweden if I'm not wrong, and it gives a decent service to millions of users, some of them don't have easy access or not access at all to some music in a physical format, even when they would like to. That's their business model. Those companies have geographical sited headquarters in planet earth, so at some point they must follow a national law. If that local law is not fair the country could be compelled to change the law. At last it's just a matter of power, since law and its obedience are very linked to actual power, it's a rationalisation of a given statu quo. People who live in less powerful countries know very well the feeling when your country has no negotiation power. Powerful countries make laws that benefit their own comercial interests and you as a civil or a company may find in a given situation the country where you pay taxes can't negotiate a better legal or commercial outcome for your interests with the foreign government that's ruining you or both of you. The same can happen within the same country, less powerful groups are affected by powerful lobbies. We hope Sweden courts and government will eventually have to answer for this and other deeds at any level. If they don't do it, that's what national states are for. That is, to negotiate with Sweden a better outcome for its fellow songwriting citizens or residents , who theoretically pay taxes on profits they receive from foreign companies. It's a win/win situation, or not. Nice moment to think about who promote the aniquilation of national and/or local states and the rise of supranationalism. Who win? Apparently in the end not common people's interests. Who can fight alone against monsters of a thousand heads? Who will be or should be on your side? Not a foreign company. Ganglord... I'm turning to you to save me... Harsh truth. The Boy With The Thorn In His Side (live) is now available on iTunes.